Turku Castle is located in the Finnish town of the same name, which with its 770 year history is the oldest city in the country. It is located on the shore of the Baltic Sea in southwestern Finland. The castle itself is situated at the mouth of the River Aura and is the most famous landmark in the city. The castle was also one of the most important strongholds of the Swedish Kingdom, as it has passed several fierce battles and sieges. Turku was the country's first capital until 1812, when Finland became the capital of Helsinki. The construction of the historical monuments in Turku, the castle and the magnificent cathedral, was started back in the 18th century. The two historic monuments are considered the oldest buildings of Finland, which are still used and inhabited. Turku Castle is the largest medieval building and has survived until today in Finland, while one of the largest surviving medieval castles in Scandinavia. In 1556, the Swedish King, Gustav Vasa I, appointed his son Prince Johan, Duke of Finland and provided the Castle as residence. It was built and furnished for his wedding with the Polish princess Catherine Yagelonika in 1562. Eight months after his brother, Eric XIV attacked the Castle, besieged it and took his brother and his wife as hostages to 1563. In 1568, already King of Sweden, Johan III held his brother as a prisoner in the Castle from 1570 until 1571. From 1597 to 1599 the Duke of Finland is the third brother, Carl, who became a victim of the carnage in the town square in Turku on November 10th, 1599. 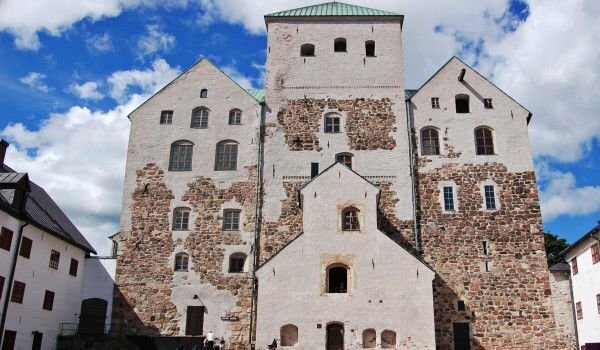 In 1614 Turku Castle was covered by fire, despite being built from new, less from its old glory remained. After, the Swedish King Gustavus III backyard was turned into a prison until 1891. Restoration of the Turku Castle was completed in 1961 with a museum section, active church and a banquet hall for special guests. Before the special menu is served, guests have the opportunity to see the extraordinary performance, showing the drama of the three brothers, told in verse and accompanied by music. The food that is served is from products with which they ate in those times, also included is the method of feeding. Today in the palace you can see some very interesting exhibitions in glass containers, utensils for eating , porcelain, jewelry, and a rich collection of ancient artifacts. Different rooms in the palace are furnished in different styles.